Nearly two years ago, we were so tickled to see Tina Knowles attend Gabrielle’s Angel Foundation’s Angel Ball with a date. 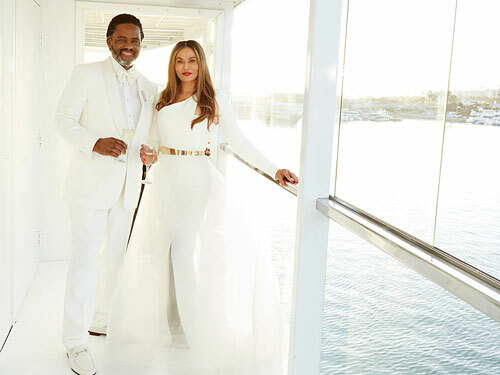 The lucky guy turned out to be actor Richard Lawson, Ms. Tina’s boyfriend, and as time went on, we were too thrilled to see that the lovebirds were still going strong. And apparently, things have been going so well between the two that they decided to make things more permanent. According to TMZ, Knowles, 61, and Lawson, 67, tied the knot during an all-white wedding celebration Sunday in Newport Beach, California. Attendees included Beyoncé, Solange, Jay Z, Alan Ferguson, Blue Ivy, Julez and a host of relatives and friends. The ceremony took place aboard a gorgeous yacht called “Eternity.” Lawson and Knowles have been dating publicly since 2013. It was the second marriage for both of them. As for their love story, Tina and Richard have known each other for over thirty years. His sister was actually one of Tina’s best friends, but they did not become romantic until Tina divorced Mathew. This is amazing news considering what Ms. Tina has been through with her ex. We wish these newlyweds all the best!